club48, USES’s after school program, provides high-quality services with curricula that support school success and promote the social, cognitive, and emotional development of the students. We have 60 slots in our licensed after school care program, serving children ages 5-12 years old each year. During the school days, the program operates from 2:30pm to 6:00pm. During school vacation days and during the summer, the program operates from 8:00am to 6:00pm. Group leaders promote school success through a wide range of activities including arts enrichment, academic support, recreation, homework time, group team building activities, and field trips. Academic support and homework assistance are key components of USES’ licensed After School Program, which weaves together social, recreational & cultural opportunities, and technology. Group Leaders assist with homework for a portion of every day. Field trips include a variety of fun, educational, and recreational activities such as visits to local colleges, museums, historical monuments, bowling, roller skating, etc. Arts enrichment helps students develop critical thinking and literacy skills, and to teach them how to use art for self-regulation and relaxation. During the summer, students participate in activities designed to prevent academic decline from occurring during the summer months. The program promotes academic success by structuring curriculum around fun activities which support the MA Frameworks for Math and English Language Arts. Our program understands the need for real parent involvement. We offer bi-monthly parent meetings, parent/group leader conferences, and workshops led by outside specialists to help keep parents informed and connected to our program and their child’s education. We collect student report cards and identify subjects in which they might benefit from extra help in order to avoid falling behind. Working with the teachers, parents, and students, we develop a plan to help each student succeed in school. This program is supported in part by a grant from the Boston Cultural Council, a local agency which is funded by the Mass Cultural Council, and administered by the Mayor’s Office of Arts and Culture. The mission of United South End Settlements is to harness the power of our diverse community to disrupt the cycle of poverty for children and their families. For further information about enrollment and/or voucher/contract renewals, please contact Karen Liberatore, Director of Program Administration, at kliberatore@uses.org or (617) 375-8173. 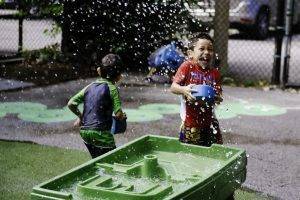 For other questions about our club48 program, contact Kaiti Coffin, Director of Early Childhood Education & Out of School Time, at kcoffin@uses.org or (617) 375-8119.
club48 is an all-inclusive after school program in the South End neighborhood of Boston. We currently have subsidized day program slots available for school-aged children ages 5-12. If you are interested in sending your child to our program, please click here to fill out an Interest Form or call us at 617-375-8150. We will be in touch soon!